Ohio State’s offensive line room just added a badly-needed recruit. Dawand Jones, a 3-star tackle prospect from Indianapolis, has signed with the Buckeyes’ 2019 recruiting class. Jones is a huge addition in a couple different ways. For one, he stands 6-foot-8 and weighs 360 lbs. But he also adds some critical depth at a spot where the Buckeyes were about to get really, really thin in a year. Jones is a very raw prospect. He ranks as the No. 88 tackle prospect and 1,018th-best player overall in the 2019 class. But he has a high enough ceiling that he picked the Buckeyes over scholarship offers from schools like Michigan, Penn State, Texas, Florida, Florida State, USC, Oregon, and Auburn. Even at 360 lbs, Jones is athletic enough that he is also a standout basketball player at Ben Davis High School. His highlight reel (below) shows Jones completely mauling a series of comically over-matched opponents while playing both tackle spots. He won’t be an immediate-impact player. Jones is likely going to require a year or two at the college level before he’s ready to contribute in a meaningful way. However, he helps fill a critical need on the Buckeyes’ depth chart long-term. And when he is ready to play, he has a decent chance to stay at tackle, which is a position of serious need. 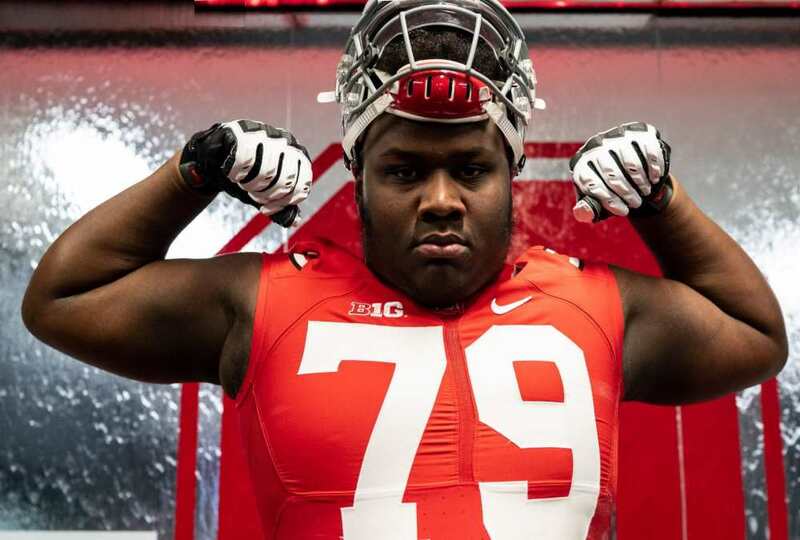 Even with Harry Miller and Ryan Jacoby already signed, OSU had just 11 scholarship linemen on the 2019 roster before Jones committed. Two of them are heading into their final seasons of eligibility, and four others draft-eligible after this fall. Adding linemen to the 2019 class is a major priority. Bringing in a big group in 2020 is even more important. Jones is a very good first step in that process. We’ve had kids his height and weight before. Too bad we whiffed on the other 2 we supposedly had a shot at today, especially Nester, but it is what it is. Hope this kid puts in the work to change from another big lineman that simply isn’t athletic enough to play to solid 2-deep material. Who was the other besides Nester? My bad, Gerd! I was conflating 1 of the 2 possible transfers with the possible signees. Seems we signed a few lineman that may be able to contribute around 2022. Could be a good long term set up. We definitely need to 1. Stay healthy up front and 2. Keep an eye out for anyone available I’m the portal. Years ago Nebraska did well with landing good walk on linemen from time to time. We may have to give that a look too.